It is one of the most well known and eaten tropical fruit, available throughout the year. Banana plants are primarily cultivated for food, but are also used for the production of fibers, which are required in the textile industry. Banana comes in its own bright yellow packet, easy to take along as a quick snack. No need to cut or clean before eating, just peel it and eat it. This explains its popularity as a fruit. Banana is a starchy fruit, but has many vital nutrients (particularly potassium), so should be included in your diet regularly. It is a rich source of potassium, so helps to maintain normal blood pressure and heart function. It contains an amino acid called tryptophan, which is involved in the production of serotonin (a brain chemical). Serotonin is known to improve the mood. It helps smokers who quit, recovering from the nicotine withdrawal symptoms, as it contains many vitamins and minerals. It also helps to improve bone health. 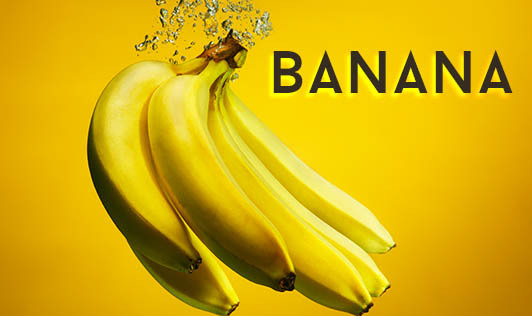 Fact: Banana is a starchy fruit and so has more calories compared to some other fruits. It also contains many nutrients (vitamins and minerals) which are good for health and help in weight reduction. And the fact that no fruits contain fats also shows that banana is not fattening.